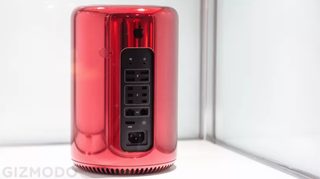 Apple is currently hard at work on a “completely rethought” Mac Pro, with a modular design that can accommodate high-end CPUs and big honking hot-running GPUs, and which should make it easier for Apple to update with new components on a regular basis. This is undoubtedly good news for Apple fans who need a powerful machine and don’t have the time or energy to build it themselves. Over the last decade, Apple’s desktop line has often languished, but each eventual refresh has revealed a machine too powerful for the average user. Aspirational machines most of us have zero use for. But the new MacPro isn’t coming this year. As Gruber notes, Apple is merely announcing the product, through five reporters (Gruber, Matthew Panzarino, Lance Ulanoff, Ina Fried, and John Paczkowski) in order to placate old MacPro fans who are eager for an upgrade and may even be eyeing sleek machines from Dell and HP (or plotting to build their own). But why was Apple even forced to placate fans? When any nerd with a credit card can go build their own PC in an afternoon, why is Apple going to take five years to build a new damn machine? The problem lies in the war of form versus function that rests at the heart of Apple’s design ethos. While successful compromise has been found, repeatedly, in the laptop space, and, reportedly, in the all-in-one space (Gruber also mentioned a new redesigned iMac is expected later this year) Apple has never quite cracked the code when it comes to desktops. It either builds big, stunning towers like the iconic G5, or it builds tiny over-designed pieces of art like the G4 Cube and 2013 MacPro. Apple has yet to find a middle ground and develop a machine that is as upgradeable as desktops demand to be, while still being as smartly designed as Apple’s lineup has traditionally been. We’re not going to get into exactly what stage we’re in, just that we told the team to take the time to do something really great. To do something that can be supported for a long time with customers with updates and upgrades throughout the years. We’ll take the time it takes to do that. The current Mac Pro, as we’ve said a few times, was constrained thermally and it restricted our ability to upgrade it. And for that, we’re sorry to disappoint customers who wanted that, and we’ve asked the team to go and re-architect and design something great for the future that those Mac Pro customers who want more expandability, more upgradability in the future. It’ll meet more of those needs. Whatever is coming next from Apple will have the expandability desktop users demand, but it certainly sounds like some of the clutch Apple design may be sacrificed in the process.